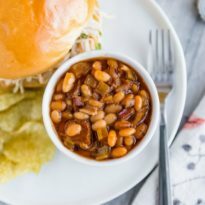 Slow Cooker Baked Beans taste a million times better than what you get out of a can, and you can easily make them in your crock pot OR bean pot! Homemade Baked Beans are tasty, inexpensive, and filling. They are great for parties and even the kids love them! Traditional recipes made in the oven in a bean pot can take upwards of 5 hours to bake, though, and that’s just not happening during the summer months. Which of course is when I want these beans at every party! 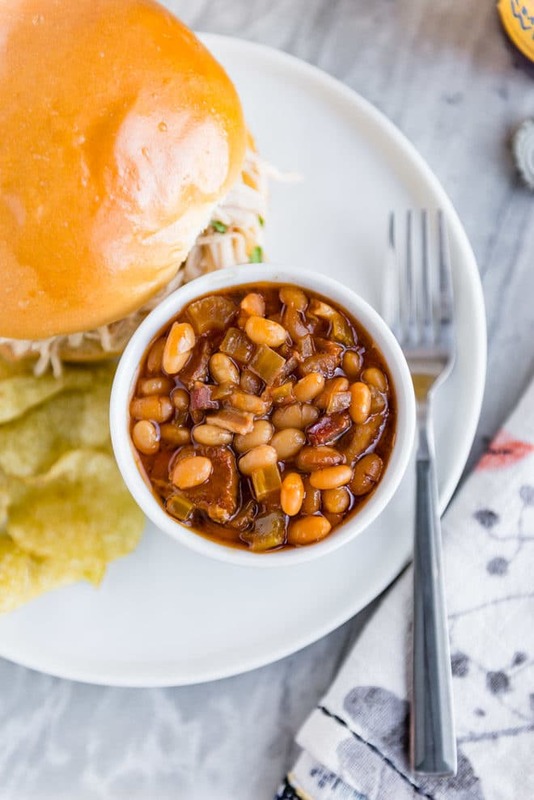 So, I developed a Slow Cooker Baked Beans version which tastes just as good as the original, but you don’t have to run your oven all day long. Which beans do you use to make baked beans? Baked Beans are traditionally made with navy beans. Sometimes in my California grocery store, I can only find small white beans. They are not the same, but they are pretty darn close. In a pinch, you could super-size and go with Great Northern Beans, too. How do you make Boston Baked Beans? 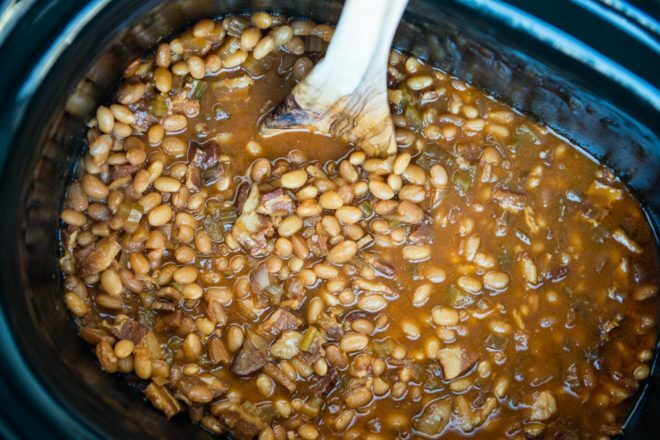 Boston baked beans are made from molasses and salt pork which means, depending on the recipe, my Slow Cooker Baked Beans are the same thing. You’d make them the same way. 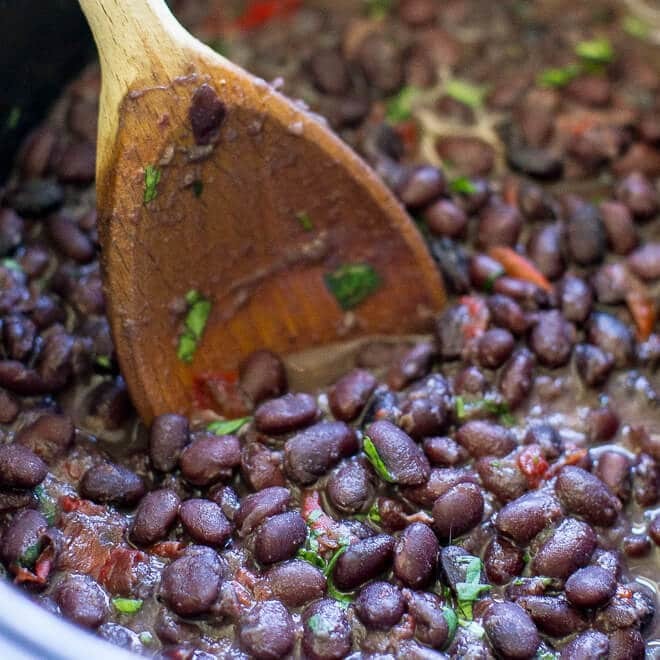 Place 1 pound of rinsed beans in a large saucepan and cover with 3 inches of water. Bring to a boil. Boil rapidly for 5 minutes, then remove from heat, cover, and let stand for 1 hour. I would also like to give a shout-out to my buddy and reader Dave who suggested I stop dumping all my soaking liquid down the drain (from both overnight soaks and quick soaks). It is just as easy to pour some of that water into a measuring cup and use it in your recipe. In drought-stricken California, it’s always good to conserve resources. For anyone else, you just layer in more flavors when you do it that way. To make beans in a bean pot, you do not need to pre-soak the beans. Preheat the oven to 250°F. In a medium sauce pan, combine beans and 1/4 tsp. baking soda. Cover with water, bring to a boil, and simmer for 3 minutes. Drain the beans (reserving 3 cups of water) and place in a bean pot . Add remaining ingredients and bake for 5 hours. 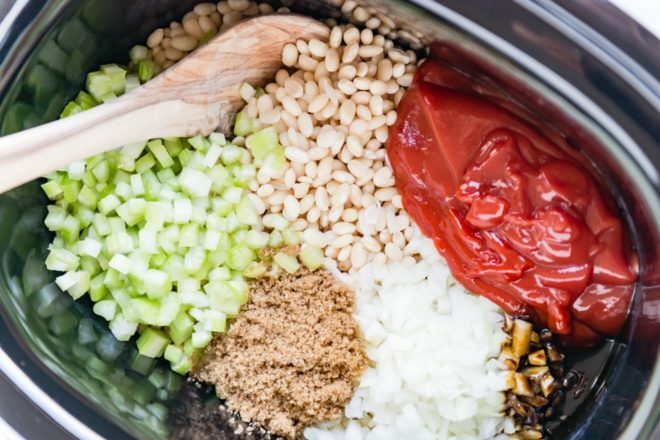 Looking for a great slow cooker? Here is the one I use and love. Pour off and reserve 3 cups water from soaking liquid. Discard remaining soaking liquid. Add beans and reserved soaking liquid, bacon, celery, and onion to slow cooker (see notes for how to cook in a bean pot). In small bowl, whisk together ketchup, brown sugar, and molasses. Pour into the slow cooker and stir to combine. Cover and cook on HIGH for 4 to 6 hours or LOW for 8 to 10 hours, or until beans are tender. Season to taste with salt and pepper if desired. To soak beans: Add 4 quarts water to a large bowl and add beans. Soak at least 8 hours or overnight. To quick soak beans: Place 1 pound of rinsed beans in a large saucepan and cover with 3 inches of water. Bring to a boil. Boil rapidly for 5 minutes, then remove from heat, cover, and let stand for 1 hour. To cook the beans in a bean pot: you do not need to pre-soak the beans. Preheat the oven to 250°F. In a medium sauce pan, combine beans and 1/4 tsp. baking soda. Cover with water, bring to a boil, and simmer for 3 minutes. Drain the beans and place in a bean pot. Add remaining ingredients and bake for 5 hours. Adapted from Shirley's Hill of Beans recipe. Is the bacon precooked, or raw? The bacon goes in raw. It definitely cooks after being in the slow cooker for so long, and the resulting bacon is soft and chewy. You could certainly precook the bacon. That would mean less bacon fat in the final dish and the bacon could be crispier, if that’s how you like it. I thought about doing it that way myself and might try it at some point. You will definitely lose something without the bacon fat. I have had beans made with precooked and added raw. Better raw. 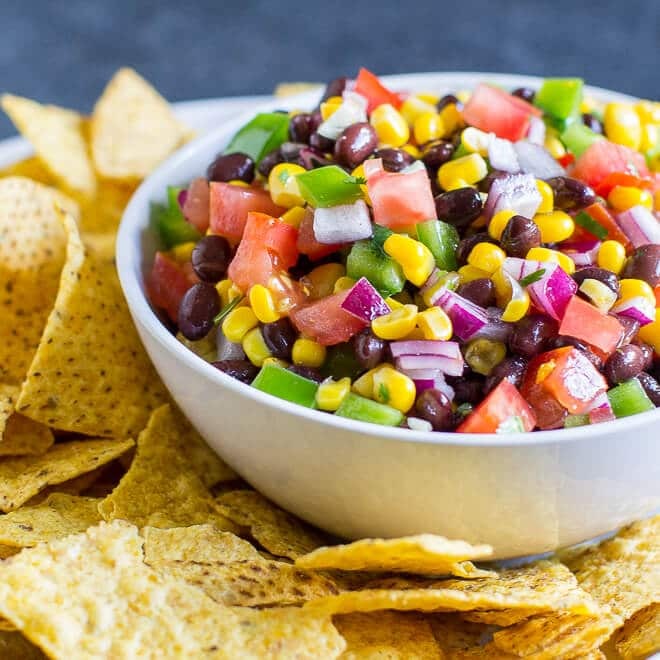 How do you adjust this recipe to make black beans for a chipotle copy cat recipe? Hi Mari, I haven’t investigated the exact Chipotle recipe (yet). The main thing is, you need to take out the bacon. Beyond that, I’ll have to look up all the ingredients they use to make sure what I have matches. But, they already taste pretty close without the bacon. Good luck! Do you think this would be tasty with pinto beans as well? I might attempt this for 4th of July picnic and have a 5 lb bag of pinto beans. I did make these today with pinto beans and they were good. I don’t know if it was the bean type or the age of the beans or the fact that I doubled the recipe but after 6 hours on high the beans were still hard. Ended up cooking them more like 11 hours! Good thing I cooked them a day early because they would not have been ready for my afternoon BBQ if it were today. Thanks! Hi Patty, I do think the age of the beans has something to do with the long cooking time (more so than the doubling of the recipe). I don’t remember the info exactly, but I read about that one time (probably in an America’s Test Kitchen cookbook) so I’ll have to see if I can find that. Glad it worked out, good job planning ahead! :) Also thanks for the update on the pintos. I use my crock pot for all the different beans I cook and lately cooking them on low for 8 hours and they are always done. Soft but not mushy. I’m definitely going to try this but my only question is I always was told not to add salt to beans while soaking or at the start that it makes them tough, is this a problem or does the salt help keep the beans from turning to mush? Hi Jerry, that is really interesting. I have always added beans to my water when soaking beans, I think America’s Test Kitchen/Cook’s Illustrated teaches that. I have never had a problem with it making beans tough. I do the same thing for my slow cooker black beans which soak in salted water for 8 hours or so before going in the slow cooker. I don’t know if the salt prevents them from turning to mush or if it just adds flavor. I’ll have to read up on this! Thanks for your question. I’m wondering myself now. I decided to make my mother’s baked beans for neighborhood night out in our new neighborhood. Due to the move, I could not find my recipe, so on a lark, I googled Hill’s Baked Beans. To my surprise there was Culinary Hill in the first few matches! I am using the traditional bean pot, and plan to put them in the oven before I leave for work in the morning. Beans are soaking now. Thank you to my wonderful niece for sharing our family beans recipe! I LOVE how versatile and filling beans are. And yours include bacon? YUM! Love that tip from Dave! I make lots of beans and always have them on hand. Older beans do take longer to cook – but they will cook. Adding salt to soak water is argumentative. Test Kitchen adds it, others do not. What’s nice about adding it at the end, is you can season it how you like it. It makes no difference to the finished flavor. Test Kitchen also adds a dab of baking soda to the soak water. Since I don’t pre-soak or discard my water, If I remember, I add it to my cook water. Baked beans are immensely popular over here in the UK – in fact, the husband and I now have a ‘beans Thursday’ (don’t laugh!) when we just have baked beans on toast so we don’t have to make a lot of effort for dinner! I’ve always wanted to try making my own, but never seem to get around to it. 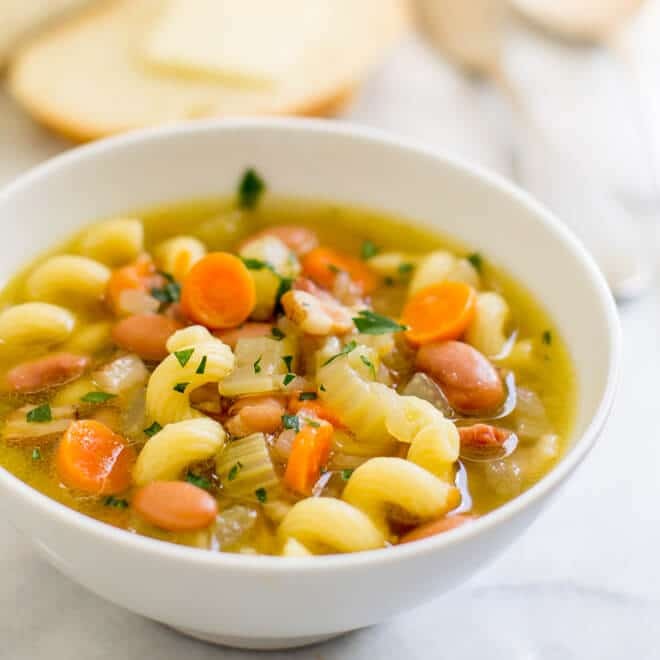 Thanks for the recipe, and for the suggestion to make them in the slow cooker! Hi Helen! I think baked beans on toast is basically the best idea ever. So delicious and satisfying. You have baked beans for breakfast sometimes too, right? You crazy brits! :) Always lovely to hear from you! Hope you’re well. Hi, do you add salt to beans on slow cooker recipe for 8 hour soak, and what size slow cooker does this fit. I have a few different sizes and would like to use the best choice. Hi Cris, there are a lot of divided opinions on soaking beans and salt use so you don’t have to worry too much. I typically soak the beans in salted water, but a lot of better cooks than me just use plain water. 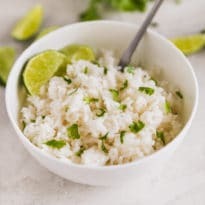 I used to discard the soaking water and put fresh in the crock pot, but that isn’t really necessary either (you can use the soaking liquid in your recipe, salted or not). I make these in a 6 1/2 quart slow cooker and it might be half-full or so. You could definitely go with a smaller one. I hope this is helpful. 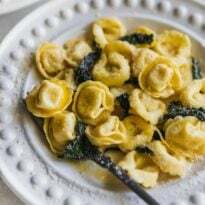 I realize I didn’t give you any very strong answers, but the truth is this recipe is pretty forgiving! Good luck and please let me know if you have any more questions. Could you also do this with canned beans? How would you change the recipe? Hi Stefanie! You could make these with canned beans and it wouldn’t take very long at all. I would say you’d need 2 or 3 hours on HIGH (just long enough to cook all the other ingredients) or 3 to 4 hours on low. Obviously the beans would already be cooked. You could actually make it on the stove top in probably 30 minutes. Good luck and if you have anymore questions just let me know! Thanks. i read that sugar and calcium prevent beans from getting soft. Hence Baked Beans So get your beans too the correct texture prior to baking. Then add the other ingredients That is why the beans retain their texture when baking..the sugar and calcium( molasses) keep them that way.